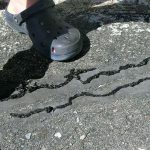 Your driveway is probably one of the most used areas of your home, and you probably don’t think about maintaining it until it seems too late. Before you are seeing cracks or stains, it is important to make repairs and maintain the quality of your driveway. Ultimately, it will be cheaper to maintain your driveway than pay a hefty amount when it is beyond repair. From the best driveway crack filler to plowing carefully, here are the ways that you can prevent your driveway from cracking. For concrete driveways, it is recommended to seal annually, whereas asphalt only needs to be sealed every few years. Sealing the driveway ensure that water does not penetrate, freeze, or crack the driveway material. Tree root growth or shrubs can also be the cause of cracking, so be sure to remove trees and shrubs that are near the driveway. In order to make sure that water flows off of the driveway surface, you can dig out a two or three inch strip around the driveway’s edge. Another way to keep water off of your driveway is to make sure that all downspouts empty into the yard and not your driveway surface. It is extremely important to not salt your cement driveway. De-icers penetrate the surface of your driveway and can cause major cracking, although it could potentially be repaired. Instead of using salt, try using a snowblower or shovel. You can also use sand or even coffee grounds to prevent ice build up. When you are plowing your driveway, be sure to place your blade just low enough so that it does not scrape or damage the surface of your driveway. If you are shoveling the driveway, try to use a plastic shovel instead of metal. The edges of your driveway are extremely vulnerable to chipping or breaking apart under excessive weight. Make sure that your car is not parked directly on the edge and that any heavier vehicles, like trucks or construction vehicles park in the middle of the driveway. Make sure to remove stains on your driveway caused by motor oil or radiator fluid to keep your driveway looking attractive. These fluids can penetrate concrete and soften asphalt. You can use cat litter to absorb the oil or grease. Driveways are an expense that people often take for granted. Make sure you do these regular maintenances so that it’s not too late. Research the best driveway crack filler and make sure to plow carefully!